This property is situated in a little piece of paradise ! Front line position situated on a stunning beachfront location just a few steps from Ponta Preta beach near Santa Maria, Sal Island.This beach resort is a new luxury 5 Star complex, consisting of high-specification villas and apartments in a beautiful and unspoilt environment, with an idyllic position on one of the few remaining undeveloped white sandy beaches in the world. Generous and exclusive amenities include twenty four hour reception and concierge, spectacular landscaped gardens and lush green areas, luxury Five Star Hotel with facilities for all villas and apartments, 150 seat restaurant, elegant wine bar and piano bar, courtesy and lounge areas, luxury spa and gymnasium, two communal pool areas and a variety of shops. All villas have private pools and gardens. A luxurious 3 bedroom, 3 bathroom villa in this beautiful and unspoilt environment, with an idyllic position on one of the few remaining undeveloped white sandy beaches in the world. This villa has a private pool and garden. Situated close to the beach front, this location just a few steps from Ponta Preta beach near Santa Maria, Sal Island. 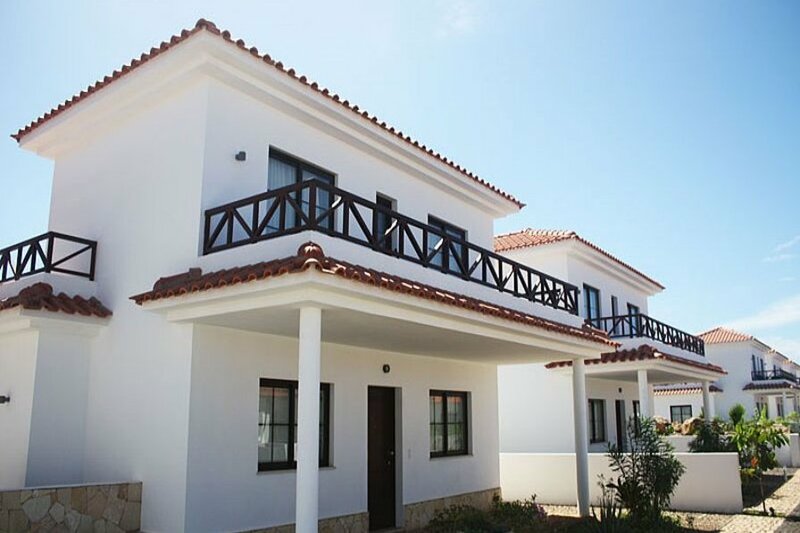 Tortuga is one of the finest quality residential developments on Cape Verde. Situated on the 2nd row line of the villa’s at the end of the row, with a frontal and side sea view, with unspolied sea views of the beach and sea. Cape Verde is an archipaelaego of 10 contrasting islands waiting to be discovered. The islands are warm and sunny all year round, temperatures ranging from 24 degrees in January to 30 degrees in September. Beautiful long fine sandy beaches and emerald green waters make Cape Verde the perfect holiday destination for year-round guaranteed sunshine. Cape Verde is beautifully unspoilt and does not suffer from mass tourism or commercialism. Perfect place to unwind, enjoy the long sunny days and friendly people to refresh and recharge yourself. The people are a blend of Portuguese, Brazilian and African and Portuguese is their first language. The locals are warm and friendly and bring a rich colourful vibrancy to the islands. Cape Verde is perfect for sunbathing, swimming, soaking up the culture, high adventure sports and fishing. The islands are rich in gastronomy, especially fish and seafood, fresh from the crystal clear waters. This amazing resort is based on Sal island but during your stay you may wish to visit one of the other islands by boat or air. Sal is the most developed of the Cape Verde islands and is ideal for beach lovers with its beautiful white sandy beaches fringed with palm trees and is totally unspoilt by commercialism. From the airport it is only a short 15 minute taxi ride to the property. Sal also attracts water sports enthusiasts who enjoy windsurfing, kite surfing, scuba diving, fishing and boating. Around the coastline there is an abundance of marine life, including tropical fish, dolphins and loggerhead turtles. Only 10 minutes from complex is the quaint town of Santa Maria with its pretty pastel painted houses in cobblestone streets. The town is rich in culture and at night comes alive with the cosmopolitan buzz or its restaurants and pavement cafes. During the day visit the pier and watch the fisherman bring in their daily catch. It is a hive of activity with the women preparing the fish and you can buy it straight out of the sea! You can also enjoy fishing trips to catch tuna and swordfish. There is plenty for everyone – young and old and is the perfect holiday for long lazy days in the sun. Resort facilities Include : - Luxury spa, gym, tennis courts, communal pools including kids pool, restaurant, wine bar, piano bar, 24 hour reception/concierge, kids club. Main restaurant: Offering show-cooking, a grand buffet of culinary delights for you to indulge in throughout your stay. Open for breakfast, lunch and dinner with a full range of international cuisine (capacity: 132). AQUA Italian: Sample the superb Mediterranean style cuisine and the finest wines recommended to you by our expert sommelier, in our fine-dining Restaurant (capacity: 72). Sway Lobby Bar: Ideal for all occasions at any time of day or night, serving tasty tapas and tantalizing cocktails as well as wide range of beers, wines, spirits and soft drinks. O Grille Beach Club Bar & Restaurant: Located right on the beach, it has a delicious menu of fresh fish and meat from the grill, as well as the finest seafood on the Island. With an outdoor terrace it is also the ideal setting to watch a glorious Cape Verde sunset (capacity: 100).